Contrary to the world’s popular opinion, these providential spoken words were authored and finished by the Holy Spirit, downloaded on my heart, after being raised in a semi-faith believing home filled with all the generational curses and strongholds deep down inside burying all my pain while creating a world of self-denial achieving the goal of becoming one of the country’s top accomplished martial artists appearing in principal roles in martial arts action films all over the world also starring in a highly popular as well as short-lived television series, two failed marriages all the bells, whistles, adulation that this world can offer I eventually ended up falling victim to living in the darkness, broken by this world, and holding on to self-hatred and using the crutch of a habitual drug addict. In other words, I was dancing with demons protecting the darkness and ingesting poison. In my naivety I was still arrogant enough to think because I was protecting young children from being molested or physically abused and people that could not protect themselves while under the influence from as much physical harm as I could, in reality of my insanity I was not part of the solution but a willing servant to the problem. I wanted to watch life go by, get high and then die. But our Heavenly Father had other plans. He took the time through His Holy Spirit and the death, burial and resurrection of His Son Jesus Christ to download these providential parables on my heart. It took over 15 years to complete over 30 Spoken Words. They’ve addressed every issue that we as human beings experience and go through in this life. 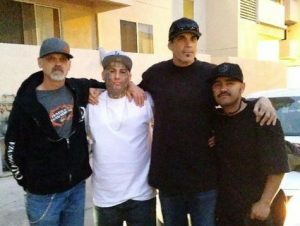 After being diagnosed with suicidal tendencies, bipolar and escaping death many times, cutting myself, punching myself, choking myself, physically, mentally and spiritually abusing myself, my only saving grace that my Heavenly Father loved me enough to use these words as a catalyst to share with others be it drug addicts, gang members, alcoholics, prostitutes, homeless, celebrities, athletes, business men and women, or society’s well-to-do. I did not know it but He would challenge me to die an addict on the floor or soldier up, break the generational curses, reach His creation and walk out the door. It is my honor, my privilege and I am so blessed to share a few of these spoken words with each and every one of you. I pray it repairs your frontal lobe and it pierces your heart. is there a moral to my story? you mean after all this can’t you feel the glory? or do we go through this life with our heads bowed? Besides all the angels in Heaven, God the Father, His Word in flesh Jesus the Savior, and His Holy Spirit, the only other witness was my mother who unfortunately made the wrong decision to take her own life behind heartache, confusion, lack of love and addiction at age 58 years old. As a footnote when my brother and I got notice of her demise, He quietly internalized it and I spiritually died inside. As I mentioned before on this website, suicide is a permanent solution to a temporary problem. We’re all going through some kind of storm. And in a dramatic storm you can’t see, you have to close your eyes. You can’t open up your mouth because your lungs can fill with water. You can’t stand up because you can be blown overboard. So you’ve got to get down on your knees with your head bowed and your eyes closed and pray, and always remember if it be thy will our Lord and Savior will carry us through the storm. So hold on, it’s always darkest before the dawn. Hold on, one day we’ll all make it home.